Traditionally manufactured as a sand casting or a continuous cast product, this near net shape investment cast neck ring allows for material savings of 20-30% as compared to sand castings and up to 50% as compared to using continuous cast bar material. Using investment cast rings further reduce machine time costs due to the weight reductions and also in tooling cost savings. This bi-metal casting, where an investment cast nickel-based alloy insert is investment cast into the bronze neck ring, is used to achieve superior wear and life in that it is the only area of the neck-ring that contacts the molten glass in the bottle making process. Although these inserts have long been supplied in the traditional sand cast neck rings, the investment cast rings are superior in holding a more precise location for the insert, which results in extremely even insert wall sections after final machining. This is very important in maintaining consistent and even solidification and heat transfer from the glass bottle surface, as the insert material and bronze have significantly different thermal conductivity. In addition, the investment cast inserted neck rings offer superior and more consistent metal fusion at the interface of the bronze and the insert. 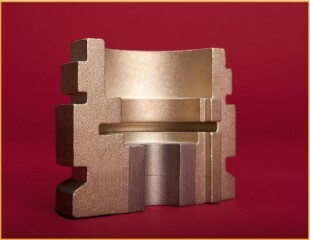 This is due to the controlled pre-heat of the insert in the ceramic mold prior to the pouring of the bronze. Not only does the superior fusion of the investment cast ring provide for a more secure hold of the insert in the casting, but this also allows for superior and more consistent thermal transfer.